What is a Gin Journey? I hear you ask. Doesn’t this sound like a rather messy alcoholic accident waiting to happen? Well, I can guarantee you that there’s no mess unless you have a drinking problem like myself (I repeatedly miss my mouth – my hand-eye coordination is a lifelong work in progress). However, a fair amount of alcohol will be consumed – purely in the name of education. OK, I lied – there is some education and a whole lot of fun. 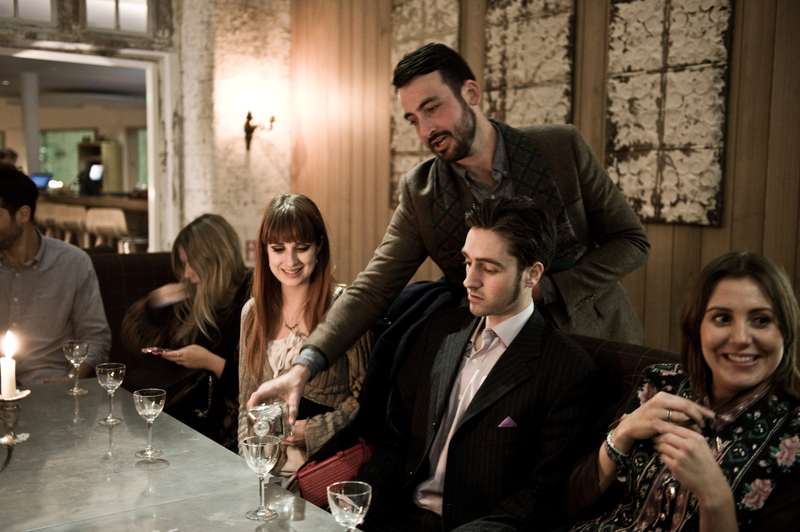 Gin Journeys are the brainchild of Leon Dalloway, founder of Shake Rattle and Stir. His website describes him as ‘originally from Leicester, corrupted in Manchester and inspired in London’ – and Gin Journeys in the capital are a seriously good inspiration indeed. Starting off in the City of London Distillery, our group gathers around a table where candles illuminate gin samples laid out next to glass beer mugs of a milky brown cocktail, topped with a beautiful white foam. 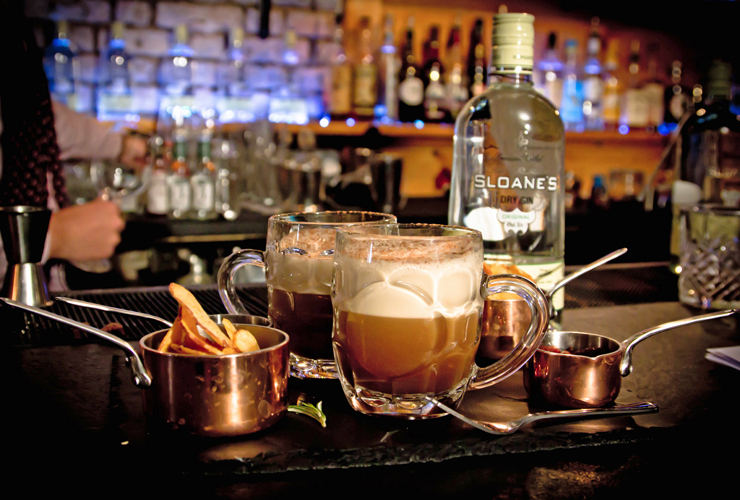 This is Leon’s signature cocktail, the award-winning ‘Hans Off My Daughter’ – a fantastic concoction of Sloane’s gin, mulled stout, chestnut liqueur, chocolate liqueur, bitters, and egg white, dusted with cocoa. The name is a pun based on the story of Hans Sloane, founder of the British Museum and name donor to Sloane Square, whose work in botany introduced some of the main flavourings of gin to the UK. Apparently poor old Hans had a daughter who was a bit of a character and married a suitor he deemed very unsuitable indeed. Just one sip of this cocktail will explain exactly why it won Leon a trip to Amsterdam, although sadly he wasn’t presented with any wayward daughters as a prize. This heavenly beverage was just the beginning of our evening. 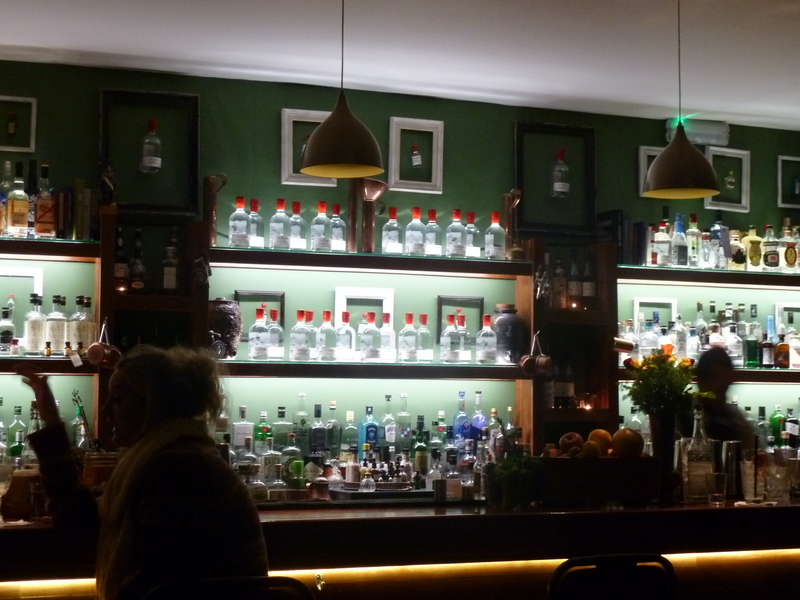 A Gin Journey involves five bars, five cocktails and five gin samples, whilst being chauffeured around in a minibus. At just £50 a head, it is ridiculously good value, especially when you consider that the evening consists of far more than tantalising the taste-buds: a Gin Journey is an educational tour. Leon is a great public speaker, talking us through the history of gin and its distilling process, engaging us with more titbits of information at every stop. History has never been so interesting. As to exactly where you’ll be heading and what you’ll be drinking, I wouldn’t want to spoil it for you. (Also, my dutiful note-taking and scholastic approach dramatically declined after the second cocktail.) However, expect to visit beautiful, quirky and atmospheric bars in Chinatown, Tower Bridge and Shoreditch, and to encounter a Bramble and a Negroni along the way. 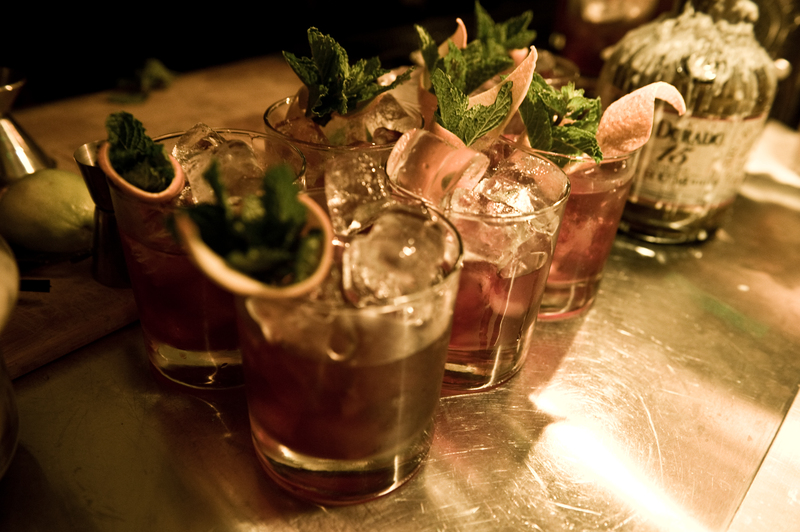 If you’re looking for a fun night out that’s a bit different – educationally alcoholic or alcoholically educational – Gin Journeys are for you. I had a fantastic time and, by the end of the evening, all I could shout was: Chin Chin, more gin! To find out more, visit Shake, Rattle and Stir.